Well, this is a clever one: an ‘alternative to self-tan’ in the form of a glow-y, gold infused oil which instantly takes away winter pallor and leaves hands, arms – and legs, come to that – looking healthier and nourished. It actually features an alternative to the traditional DHA tanning ingredient called erythrulose, which kicks in after a couple of days of use, stays golden (not orange) and lasts longer. 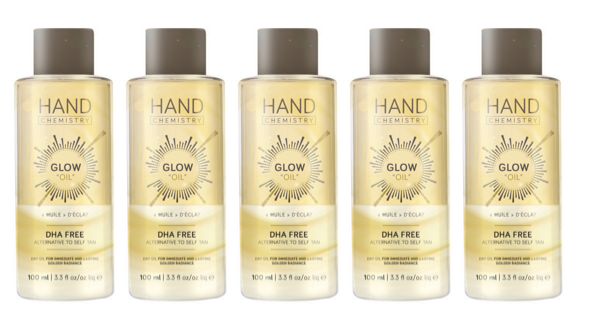 Being slightly blind without glasses, though (and with the usual fine print on the box to deal with), we used it on the backs of hands first of all –and actually found it rather de-ageing. The formula seems to ‘blur’ the appearance of veins – always welcome, frankly. However, we suggest you ignore the name (Hand Chemistry really should be thinking of rebranding as ‘Body Chemistry’), and slather all over. Because summer really is coming, at some point, we’re reliably informed.